Attention, husbands and boyfriends: unless your significant other explicitly states that she wants a red Samsung Galaxy Tab for Valentine's Day, do not rely solely on this deal to please her. Add some chocolate, roses, a spa treatment, et cetera to sweeten the pot. That said, this eBay Daily Deal from Adorama is pretty good, if you want a small tablet that isn't the Nexus 7. 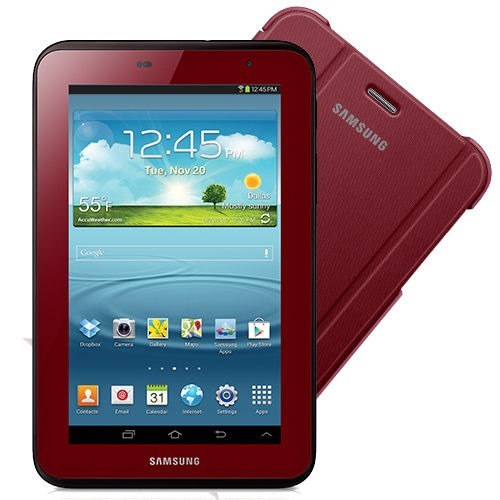 $179.99 will get you the Garnet Red Galaxy Tab 2 7.0 and a matching case, normally a $220 package. As we stated earlier, there's no difference between this Garnet Red Galaxy Tab and its less flamboyant predecessor - you still get a somewhat dull 1024x600 screen, 1Ghz dual-core processor, 8GB of storage with a MicroSD card slot, and Android 4.1 with TouchWiz. The case is a nice touch (it's included with the red retail version). Shipping via USPS if free, but could take up to 10 business days, so you might want to spring for UPS if you want to get it by February 14th. There's no time limit, but there are a limited number of tablets available. And ladies, if you want to get your man an Android tablet in lieu of candy or flowers, it's probably OK.